For many years Norman had been a prominent worker in the local Labour movement, and was Chairman of the Whitfield Labour Party. He stood as a candidate in the parish council elections but was unsuccessful. He was a very keen trade unionist and a member of the Co-operative Society, who frequently played a prominent part at quarterly meetings of the Society. On 9 August 1950, Norman was knocked down by a car near his home, “Kenwyn” on Sandwich Road in Whitfield. The car did not stop, and Norman was killed instantaneously. He was 65 years old. Norman was standing near his home shortly after ten o’clock when he was knocked down. The car drove on. Police officers immediately began inquiries and circulated a description of the car, which it was thought might have a broken headlamp or windscreen. The car was believed to be a light blue saloon of 10 or 12 hp. The following is the full text of a report published in the Dover Express and East Kent News on Friday, 1st September 1950. It is a detailed account of the Coroner’s inquest into the circumstances and cause of Norman’s death. After an inquest lasting altogether 7 1/2 hours, spread over two days, a Dover jury yesterday (Thursday) returned a verdict of “Manslaughter” against Sidney Vincent Kelly, a local AA Port Officer, of 25, Princess Walk. Mr Mayne was killed, a few yards from his home, on August 9th, by a car which did not stop. A story of how Kelly, a married man, visited a nurse at Whitfield, in a borrowed car, on the night of the fatality was related when the inquest – previously adjourned – was resumed on Wednesday. After a hearing which lasted five and half hours the Coroner (Mr J A Johnson) adjourned the enquiry until Thursday saying, that justice was not always best administered at a late hour of the evening, when those who had to administer it were tired. At the outset the Coroner warned the jury that Mr Kelly might be referred to as the driver of the car involved, but he understood that Mr Kelly did not admit that. Ultimately, therefore, there would be two issues before they jury – who was the driver of the car involved in the accident, and the nature of the driving of that car, whether driven by Kelly or not. Before taking any evidence, the Coroner suggested to Mr N W S Mitchison, who represented Kelly, that his client should come up from the back of the Court so that he could personally hear all the evidence. The first witness was Frederick Roland Prescott, of 28 Elms Vale Road, Dover, a transport fitter, who said that he had known Sidney Kelly four to five years. On Wednesday, Aug 9th, witness attended a meeting of the Dockyard Social Club at the Oddfellows Club, Pencester Road. He went there about 8pm, and Kelly was there when he arrived. 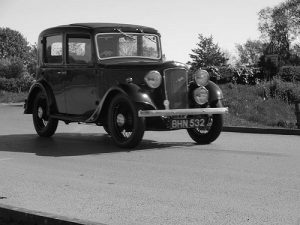 They left the hall together at approximately 9.10pm in the witness’ car, a 1936 Austin 10, registration number DNO341. Kelly drove the car in pursuance of an arrangement between them that when they were together, as they frequently were, the last one out drove. They drove down Pencester Road and along Maison Dieu Road to Liverpool St, round the Monument and through the Market Square to the Metropole Bars. As they pulled into the kerb there a car, which had been stationery, started to move, and caught the rear nearside wing of the witness’ car, which was damaged by the impact. Mr Prescott continued that, after a conversation with the driver of the other car, the witness and Kelly went into the Metropole Bars, where they had two pints of beer each. They left together, between 9.30 and 9.40pm, he thought. “As we came out of the Bars, Kelly said he would like to make a call at Whitfield, and I told him to take the car and pick me up later,” Mr Prescott said. The arrangement was made that Kelly should pick him up later at the Oddfellows Club, and Kelly thereupon drove off alone in the direction of Whitfield. Questioned by the Coroner, the witness said that apart from the slight damage to the mudguard the car was in perfect condition. There was glass in both headlamps, and there were no dent in the coachwork, the body having recently been re-sprayed. The Coroner: At the time had you any reason to think there was any trouble with the headlamp switches? Witness: The evening before I noticed that the dipper switch did not operate first time, but with an extra stamp on the pedal it would work. Asked about the glass in the headlamps, Prescott said he had never been sure, but had the impression that the glass was not the same in the two lamps. Kelly, he said, came back to the Oddfellows Club at about 10.40 to 10.45 that night. Kelly was alone in the car, and the witness immediately got in, not paying any particular attention to the condition of the car. They drove to Kelly’s home at 25, Prioress Walk. Either on Crabble Hill or just as they turned off, Kelly switched on the headlights, having previously remarked that the dipper switch was not working. Prescott explained that it was necessary to give the switch an extra kick. Nothing more was said about it, and the witness noticed nothing wrong with the lights. Nothing was said about an accident. After Kelly had gone into his home, Prescott drove away, and parked the car in a friend’s backyard in Folkestone Road. He did not examine the car. The yard was just behind the house and out of sight of the road, but there were not gates to protect it. He left the ignition key so that the householder could move the car if he wished. The following morning he went with his wife to collect the car at about 7.30. He did not think the car had been moved during the night. He was pointing out the damage to the rear mudguard when his wife saw a piece of glass on the nearside front wing. They examined the car then and found that the near side front wing was slightly damaged and the nearside headlamp slightly back and the glass missing. The headlamp bulb was still in position, but had fused. “I thought he had chopped a post or a tree, and I intended having it out with him that evening,” Prescott said, adding that he had an arrangement to meet Kelly again later that day. During the lunch hour, because of what he had heard, he made a further inspection of the car. He found a circular dent in the near-side upright of the driving screen. About the dent was what looked like hair. “I was told a man had been killed, and I went to the Police Station straight away,” Prescott said. As the Coroner was continuing to question him about his visit to the Police and whether he took the car, Prescott, who had been an hour in the witness box, collapsed, and was carried from the Court by Chief Inspector Young. While Mr Prescott was recovering in the fresh air outside, the Coroner called Dr George E Turfitt, Deputy Director of the Metropolitan Police Laboratory, who gave evidence of receiving a number of articles from Det-Sgt Lilliott. Dr Turfitt said that he assembled some of the pieces of glass said to have been found at the scene of the accident, and discovered that they formed part of a glass identical in pattern and dimensions with the Lucas headlamp glass sent him. He produced a photograph of the assembled pieces. The glass labelled as having been found on the wing of the car comprised several small splinters, and the witness also found several splinters still adhering to the rim of the headlamp. He compared those two lots of fragments, and they were analytically identical, not only with each other but also with the glass labelled as having been found at the scene of the accident. The cloth cap, the witness continued, was composed of wool fibres of four different types. The fibres in the envelope sent to him were identical in texture with the fibres of the cap and had the same colours. He came to the conclusion there was complete agreement between the cap and the fibres in the envelope. Dr Turfitt added that he had that afternoon examined the car, and, in the paintwork of the dent on the nearside pillar was the imprint of a woven fabric similar in texture to that of the cap. Mr Prescott then completed his evidence, saying that, when he went to the Police Station, he had not seen Kelly. He handed his car over to the Police, and told them all he knew of the matter. Replying to Mr Mitchison, the witness said that Kelly’s demeanour outside the Metropole Bars was normal – “happy go lucky” – and there was no change when they met again later outside the Oddfellows Club. The witness agreed that the reflectors of both his headlamps were poor, the nearside one being so bad that it was impossible to tell inside the car if the lamp was alight unless the offside lamp was cut off by the dipper. He used the headlamps when he drove home from Kelly’s house, but did not notice anything wrong with the nearside lamp. He tried the dipper, but it did not operate the lamps. Asked by Mr Mitchison about the suspension of the car, Mr Prescott said he had had new shock absorbers fitted front and rear, but the front ones had been adjusted for rough ground. In consequence, on good roads and with only one person in the car, any bump was much more noticeable. In reply to Mr G H Youden, who appeared for the insurers of the car, the witness said the owner of the other car involved in the outside the Metropole Bars had agreed to pay for the repairs, and he attributed no blame to Kelly for that accident. Miss Cecile Mabel Etheridge, a District Nurse and Midwife, of “Hope Cottage”, Whitfield, stated that she had known Kelly for about three years. On the evening of August 9th, she said, she was alone at home. She was not expecting Kelly, but thought he might call, and was not surprised when he did so. He arrived between 9.30 and 10pm, but she could not say the exact time because she was extremely busy. She fixed the times by the radio programme which was on. Miss Etheridge said Kelley left about 10.30 as near as she could say. He was alone. She knew he had come by car, but she only caught a glimpse of it as she opened the door because it was on the other side of the road. Kelly seemed to be his normal self, and was quite cheerful. He made no reference to an accident. As he was leaving they arranged to have coffee the following morning in Dover. This meeting took place in a cafe in Townwall Street. They had met for coffee over fairly lengthy intervals. Nothing was said at this meeting about any accident the previous night. Mr Youden: In fact, Mr Kelly was of the same demeanour as the previous evening? Dr V H Bowers, County Pathologist, who had given evidence at the previous hearing, was recalled while his deposition was read to the juror, to the effect that a post mortem examination showed an extensive fracture of the skull consistent with a severe blow on the back of the head. The cause of death was the fractured skull. Mrs Lilian Eleanor Lines, of the “Newcastle Inn”, Ewell Minnis, next gave evidence, saying that about 9.40pm on Wednesday 9th August, she was driving her husband’s car along the Sandwich Road at Whitfield towards Dover. It was dark, but it was a fine night. There had been some rain, but she thought the road surface had dried. Her headlamps were on, but dipped. Asked by the Coroner if she saw anyone walking in the road, Mrs Lines said she saw no pedestrians. As the car got nearer to her – possibly 200 yards away – its offside light went out. “The car began to zig-zag towards me,” the witness continued. “I swerved to my nearside to get out of its way, and stopped. I thought at first we were going to hit head on. The Coroner: Did you hear any other sound? Witness: Yes, like women talking and laughing. The people in the car appeared to me to be laughing. The Coroner: Do you say that because of what you saw or what you heard? Witness: It sounded like a woman’s laugh. The Coroner: You did not look to see if there was a women in the car? You did not notice how many people there were in the car? Witness: No, my mind was on keeping out of the way. In reply to further questions by the Coroner, the witness said she saw no one knocked down. The car continued without appearing to slacken speed. There were three passengers in her car. Two got out immediately, while the witness turned the car round with the object of following the other car. But it had disappeared by the time the witness got her car turned, and they could not find it. Questioned by Mr Mitchison, Mrs Lines said she thought the other car was a light coloured one of an old type. She turned to follow the other car because, on looking out of the window, she saw the man lying partly on the grass verge at the other side of the road. After an adjournment for tea, evidence was given by Alto Bloomfield, a fitter, of Hawthorne Cottage, Ewell Minnis, who was one of the passengers in Mrs Lines car. He was sitting beside the driver, he said, and was dazzled by the headlights of the other car, which swered to the crown of the road. The car then dipped its lights and there was a noise of glass falling as the two cars got very close. If the other car slackened speed at all it was very little, and it passed them fairly fast. As they stopped he saw a man lying on the other side of the road. The witness stayed in the car to give chase, but did not see the other car again. Answering Mr Mitchison, the witness said he did not hear the shouts, laughter or talking from the other car as described by Mrs Lines. They went about four miles towards Eastry in their search for the other car. Another passenger in Mrs Lines’ car, CSM Richard Brooksbank, RASC, stationed at Old Park Barracks, said his attention was drawn to the other car when it swerved violently towards the offside of the road. “As it swerved I saw a form thrown to the nearside of the road,” the Sergeant-Major said. The car was then about 150 yards in front of them. After this incident the car returned to its own side of the road, but did not stop. By the time he got out of the car the other one was out of sight. There was a bend in the road three or four hundred yards away. In reply to Mr Mitchison, the witness said he did not remember whether the car’s lights were dipped when he saw the form flung to the side of the road. He remembered no noise of breaking glass. Answering Mr W A Finlay, who appeared for the deceased’s relatives, witness said he eventually found deceased at the side of the road, but he was unable to say whether Mr Mayne was wearing light or dark clothing. It was too dark to see. CSM Arthur Ronald Luscombe, RASC, Old Park Barracks, the third passenger in Mrs Lines’ car, said his attention was arrested by a tinkling of glass, and he saw the other car swerving. He looked through the near window, but the car had gone too far for him to get the number. He had feared it would turn over, and it was a surprise to him that it was able to keep on its four wheels. When he got out of the car he found the man lying in the road, the upper part of his body on the grass verge. Replying to Mr Finlay, the witness said that the deceased wore a light-coloured coat, and his car was near him. Donald William Alfred Kelvey, 47, Folkestone Road, Dover, ambulance driver, said that he received the call at 9.54pm, and estimated the position of the body as about 20 yards on the Dover side of Whitfield Fire Station but on the opposite side of the road. There was no sign of life, but the man was removed to hospital as quickly as possible. There was a pool of blood in the gutter under the man’s chest. PC H Chappell said that he went to the scene of the accident in a Police car. It was a very dark night with no moon. He found the pool of blood, outside the house “Sea View,” and fragments of glass – which he gave to Sergt Lilliott – over an area from the pool of blood for a distance of 86 yards in the direction of Sandwich. He could find no skid or brake marks on the road. The road was 20ft 6ins wide. Questioned by the Coroner about “Hope Cottage,” the home of Miss Etheridge, PC Chappell said that “Hope Cottage” was in Napchester Road, a turning on the right hand side further along Sandwich Road towards Eastry. He estimated the turning was four to five hundred yards from the scene of the accident. The deceased’s home “Kenwyn”, was 86 yards on the Sandwich side of the accident, so that had he been walking home he would have his back towards Dover. Inspector R W Piddock gave evidence that at 2.30pm on August 10th, with P Sgt Lilliott, he examined Mr Prescott’s car in the warehouse yard of Messrs Warren and Reynolds, and found slight damage to both nearside wings and the headlamp and a dent at the top of the windscreen pillar. The dent appeared to bear the impression of a fabric, and there were fibres adhering to it. Having interviewed the owner, the witness took the car to the Police Station yard, where small particles of glass were found on the nearside front wing. The witness said that his information was that he (Kelly) had borrowed a car the previous evening, and the witness asked where he had been with the car. Kelly’s explanation was that he had driven the car-owner, Mr Prescott, to the Plaza about 9.30pm. There, he had been involved in a slight accident and had suffered damage to his nearside rear wing . After that, he and Mr Prescott, he said, went to the Metropole Bars, where they had two drinks each, after which they came out, and he (Kelly) took the car, picked up a friend, and went down on to the Sea Front. Inspector Piddock said he questioned Kelly further, and he later said, “I did not go to Whitfield.” The questioning was taken up by Det-Sergt Lilliott, but Kelly continued to deny going to Whitfield, and said he had taken a friend in the car up the lane by Charlton Cemetery. He was asked to give the name of the friend but refused. He said he later took the car back, and met Mr Prescott as arranged about 10.30pm.. He refused to say anything further. Continuing inquiries, about 7.45pm the same day the witness and Sgt Lilliott saw, and took a statement from Miss Etheridge. The witness then saw Kelly again, in the Metropole Bars. He was asked to go out into Cannon Street, where all sat in the Police Car. The witness cautioned Kelly and told him he had found his friend, Sister Etheridge, and asked whether he wished to say anything further. Kelly replied, “The story I told you this afternoon was lies”. He was invited to make a statement, but said he had had a few beers and did not consider it fair that he should make a statement at that time. The witness agreed with him, arranging that Kelly should call at the Police Station the following morning. This he did, accompanied by his solicitor. He was cautioned, and made and signed a statement. The statement described meeting Mr Prescott in the Oddfellows, and the visit to the Metropole Bars. Coming to the journey to Whitfield, the statement said that in going up Crabble Hill he found that the dipper switch did not operate. This meant that he had to drive with only side lights when approaching on-coming traffic. “I went to the top of Whitfield Hill,” the statement read, “and along the main Dover to Sandwich road, and turned to the right at the first cross-roads I think the road is called Napchester Road. I visited a friend about 400 yards and arrived at approximately 10pm. Answering Mr Mitchison, Inspector Piddock said that Kelly’s explanation for telling lies when first interviewed was that he was a married man, and his wife knew that in the past he had had an association with a girl at Whitfield. He said he was afraid that if his wife knew he had been to Whitfield she would immediately think he had been seeing that girl again. Further questioned, Inspector Piddock estimated that the distance from the pool of blood to the Napchester Road turning was half-a-mile. The road wound a trifle between those points. At the conclusion of Inspector Piddock’s evidence the Coroner adjourned the inquest until Thursday. When the inquest was resumed yesterday, the first witness was Det-Sgt L J Lilliott, who gave evidence of taking the glass framents, fibres etc, to the Metropolitan Police Laboratory. Harold William Porter, 61, Maison Dieu Road, Dover, an electrical engineer, said he overhauled the wiring system of Mr Prescott’s car in May. He fitted a new Lucas glass, similar to that produced, to the nearside headlamp; it did not match the glass in the offside lamp. In reply to Mr Mitchison, the witness agreed that both headlamp reflectors were very bad and new ones were on order. As a result of the condition of the reflectors, the nearside light would give no beam; the other would be a little better. In his summing up, which lasted 55 minutes, the Coroner said that if the jury came to the conclusion that the car involved in the accident was Mr Prescott’s, he thought they must come to the conclusion that it was driven by Kelly. There had been no suggestion, even from Kelly himself, that anyone else was driving the car between 9.40 and 10.40 that night. On the question of whether, in fact, it was Mr Prescott’s car which was involved, Mr Johnson said it seemed to him that the circumstantial evidence was as perfect as any circumstantial evidence could be. He felt the jury must come to the conclusion that it was that car which was involved in the accident. After calling attention to the evidence given on the nature of the driving of the car involved, Mr Johnson dealt with the fact that the car did not stop after the accident. “We have got to be very careful about that,” he said. “We are not considering whether the driver was guilty of inhumanity or moral cowardice. If he knew the accident occurred, I think he was guilty of inhumanity and moral cowardice, but it does not follow that he was driving with reckless disregard for human life and safely. “It is conceivable, of course, that if he did know, he said nothing to Sister Etheridge. One does not always tell the inner secrets of one’s affairs, even to one’s close friends. Sister Etheridge says she say him again the following morning. The Coroner questioned whether the damage to the car could have been done without the driver knowing, and said that, if that was the case, was there any more cogent evidence of reckless disregard than to drive without knowing such things? “Do you think that, like his first statement to the police, the denial was a lie and that it was made because, as soon as the accident happened, he decided, in the agony of the moment, to drive on for the same reason that he told the first lie – to keep Sister Etheridge out of this miserable matter? Ask yourself if that is not probabale. “But that is not the case he puts before you. If he had said to the Police officers: ‘It was my car and I knew the accident had happened, and I know now I ought to have stopped, but drove on because, in the split second I gave myself to think about it, I thought – Sister Etheridge, my wife – that is the sort of decision a man in the agony of the moment might take and if that had been his case, I should have felt a good deal of sympathy for him. Mr Johnson warned the jury to do nothing out of resentment or indignation against drivers who did not stop, and pointed out that if they decided it was manslaughter they would not have convicted the man. It would be the Coroner’s duty then, to put the man on his trial at the next Assizes. The jury, which included two women, were half an hour considering their verdict, and the foreman announced that they were unanimous that Mr Mayne’s death resulted from a collision with a car driven by Kelly in such a manner as to constitute reckless disregard of life. The Coroner said he would have to sign a warrant for committal to the next Assizes, but he would endorse it for bail. Mr Mitchison said he had a surety in Mr Prescott, who had given evidence in the case. The Coroner then bound over Kelly in the sum of £50 and Mr Prescott in a like amount, to ensure Kelly’s appearance for trial.